Majestic, sustaining, enduring, but increasingly vulnerable—these words only begin to describe one of the earth’s most critical life forms: trees. 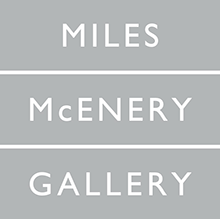 This selection of works by emerging, national, and internationally acclaimed artists explores the imagery of trees as a potent signi er, the metaphoric power of which extends from concepts about beauty and the power of nature, to time and timelessness, as well as the despairing realization about the disruption and impending desecration of our forests and the natural environment. Trees matter. Essential for life, they provide oxygen, lter the air, and remove carbon dioxide. Their roots anchor, lter, and enrich the soil. They provide habitat for wildlife, shelter in the form of shade and building materials, and sustenance such as olives, nuts, and abundant varieties of fruit. Trees are also one of the oldest organisms on the earth, with some that can live up to an astonishing 5,000 years. Equally important, trees can have immense personal and cultural signi cance and are revered not only for their beauty but for inspiring and enriching the soul. With a diverse range of artistic approaches and media— from the moving imagery of video installations to ceramic sculptures and from stainless steel representations of dendritic or branching structures to delicately hand-cut paper sculptures—artists in this exhibition probe this iconic symbol and its allusions to signi cant and often profound ideas. Infused throughout much of the work in the exhibition is the prevalence of beauty—pristine, sometimes sublime, always powerful—and how trees can embody that while laden with underlying subtexts. August, even majestic, with sun ltering through its massive boughs, is the monumental image of Diane Cook and Len Jenshel’s Emancipation Oak, 2014. This spectacular photographic image is awe inspiring—not only for its visual beauty, but for the importance of what it symbolizes. Located at Hampton University, one of the nation’s leading historically black universities, it was under this oak in 1863 that the black community of Hampton, Virginia, gathered to hear the rst Southern reading of President Abraham Lincoln’s Emancipation Proclamation abolishing slavery, and it was under this tree that formerly enslaved members of that community were rst able to receive an education. Standing near the entrance of the university, the Emancipation Oak stands as a symbol of freedom and the pursuit of knowledge for all. Sam Krisch’s photographic works of trees isolated in the wintery landscapes of Hokkaido, Japan, eloquently capture the pristine beauty of nature and the meditative power of silence. Poetic, even reverential, they convey a sense of universal timelessness—of time stopped, lapsed, or receding into the horizon. A delicate, mesmerizing beauty characterizes Japanese artist Yuken Teruya’s astonishing miniature trees cut out of toilet paper rolls and designer shopping bags. Created with meticulous exactitude, these marvelous sculptural forms speak to the fragility and vulnerability of trees while making a statement about the transformation of humble, cast-off materials. Exquisite, almost breathtaking images of ice-laden Appalachian trees make up Michele Sons’ suite of photographs, taken in winter—a season which, for Sons, offers a “time to see clearly, to nd clarity and simplicity, wonder and beauty.” Also rooted in the Southern landscape are the evocative silver gelatin prints by Linda Foard Roberts. Mysterious and elusive, the venerable trees she portrays have, for Roberts, stood the test of time and bear witness to the memory of a distressed and scarred past. In Mercy, 2006, for example, with rope threateningly coiled around the tree’s trunk, she juxtaposes the beauty of the Southern landscape with the pain of its history. It is a trenchant image that can also imply the vulnerability of trees and the peril they face with advancing urban, industrial, and commercial interests. Also probing the notion of landscape as a witness to history is the work of Israeli artist Ori Gersht, whose prolonged exposures of gnarled ancient olive trees in Palestinian villages in Israel are beautiful but haunting photographs that speak to that landscape as a sacred, fragile, and contested space. This intersection of beauty and violence and the notion of landscape as a witness to history are evoked again in Gersht’s stirring video installation Forest, 2005. Filmed in the remote regions in Southwest Ukraine, the site of Nazi atrocities, this beautiful forest scene becomes ominous as a massive tree slowly crashes to the ground, simultaneously conveying an acute recognition of place as a site of memory, history, beauty, and horror. Vestiges of the past weave into the Italian artist Quayola’s video installation Pleasant Places, 2015. The video transports, or rather dislocates, the viewer in time, merging past and present, realism and abstraction in a re-imagination of Vincent Van Gogh’s countryside of Provence 125 years later. In this work the artist digitally morphs realistic images of windblown trees and elds where Van Gogh lived into swirling abstract scenes of disintegrating pixels, bringing to mind the underlying forces of nature and the dynamics of change. The forces of nature and the dynamics of change are evident, too, in Claire Sherman’s dynamic paintings of archetypal forest scenes. Abstraction and pictorial realism converge with a raw beauty in Sherman’s large-scale paintings, immediately eliciting the sheer, visceral power of nature. Fragmented, often shattered picture planes speak to the strength of natural forces but also to the vulnerabilities that both nature and/or humans can in ict. With its fractured and broken limbs, the tree in the painting Tree, 2010, is portrayed as imperiled, if not on the brink of destruction. The complex nature of man’s relationship to place and landscape is also probed by Australian artist Rosemary Laing in two photographic works that represent staged interventions that allude to both the destruction of the Australian rainforest and Indigenous cultures. In these works Laing blurs fact and ction, a “river” of manufactured fabric on the forest oor, acting symbolically as an invasion—an emblem of colonial occupation and the intrusion into and domestication of the natural environment. On the other side of the world, the vulnerability of the natural environment and encroaching urban development is an underlying concern for Elizabeth Bradford. Raised as a naturalist, Bradford’s paintings of forest scenes in the Carolinas are motivated by a sense of urgency to preserve and protect the memory of nature’s beauty before it disappears or is changed forever. The nature/culture divide as a theme continues in Tom Nakashima’s paintings and prints. Throughout Nakashima’s career he has consistently explored the imagery of tree piles—originally derived from piles of downed, tangled, and twisted tree trunks and branches from cleared apple orchards where he lived near Berryville, Virginia. 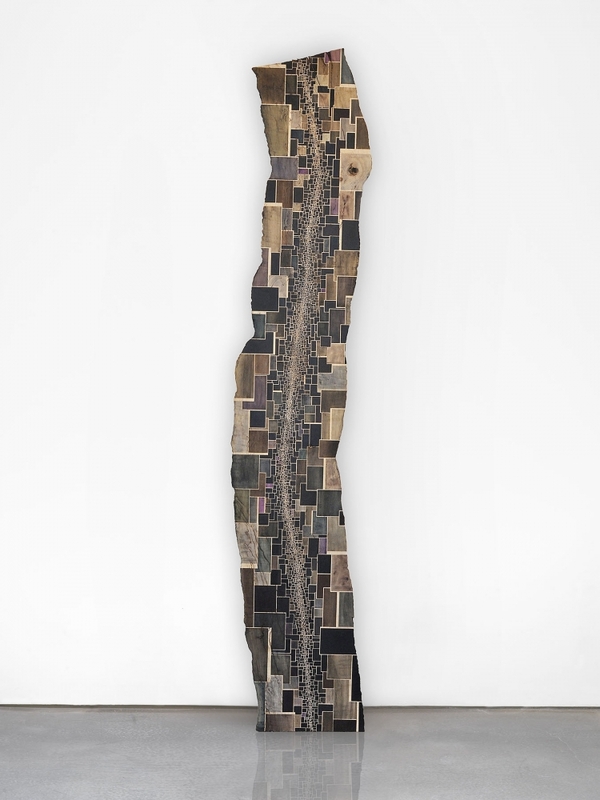 In his painting Edge of Chaos, 2003, a tree pile represented in close-to-abstract form against a collaged background of newspaper clippings makes a statement about the human encroachment on nature— urban sprawl and the ever-advancing built environment. Meticulously rendered with an astounding hyperrealism, Eric Serritella’s Trompe-l’œil representations of birch trees, branches, and weathered logs are ceramic sculptures, built out of clay then carved and red in oxidation with ceramic stains and oxides. Serritella’s use of ceramic in his sculptures symbolically mirrors both the fragility and durability of the environment, which he remarks is “easily damaged if disrespected and yet invincible in its inherent beauty and longevity.” His adept evocations of birch trees, which he refers to as “angels of the forest,” speak to the splendor and tenacity of nature in the face of today’s environmental assaults. Jason Middlebrook uses actual trees in his art, transforming planks and slabs of tree trunks into hybrid sculptural forms: “plank paintings” that exist somewhere in between painting and sculpture. Using tree planks as his canvas, Middlebrook applies hard-edge lines and glossy, industrial colors to paint abstract geometric compositions onto the wood grain. His vibrant geometric shapes and gleaming surfaces seemingly reference the manufactured while incorporating the organic form of the sculptures’ structures. Fluidly melding the manufactured and industrial with the organic is internationally acclaimed artist Roxy Paine, who is represented in the exhibition with two of his tabletop stainless steel Dendroids. These small-scale sculptures reference Paine’s signature arboreal or tree-like sculptural forms that speak to branching or dendritic structures—anatomical, industrial, and ecological systems that range from vascular and neural networks to industrial and engineering systems, computer board circuitry, tree root systems, river deltas, and fungal mycelium (the connective tissue that allows a single organism to spread underground). This exploration of dendritic structures delves into questions about the colliding forces of industry and nature, the natural and the arti cial, and—by extension—control and chaos, growth and destruction. In serving as subject matter for these artists, images of trees become compelling works of art, ones that spur contemplation and connection to a multiplicity of ideas. For many of us, trees are also perhaps rst and foremost a constant reminder of life’s cycles with falling leaves in advance of winter, followed by renewal and growth in spring and summer. Even more so, they are an enduring reminder of the beauty, mystery, and grandeur of nature.